For Christmas my husband bought me lots of new baking equipment but the one thing I have been dying to try out for the past month is my sugar thermometer. I’ve always wanted one of them ever since I was younger and had a failed attempt at making fudge without one, so I was naturally excited to try it out myself. One of recipes I have seen used a lot recently on TV, which required the use of my sugar thermometer, is the Italian Meringue. This is made by whisking egg whites then adding a hot sugar syrup heated to the soft ball stage, which cooks the egg whites and once piped onto your cake or pie put under a grill or use a chef’s blowtourch to brown. 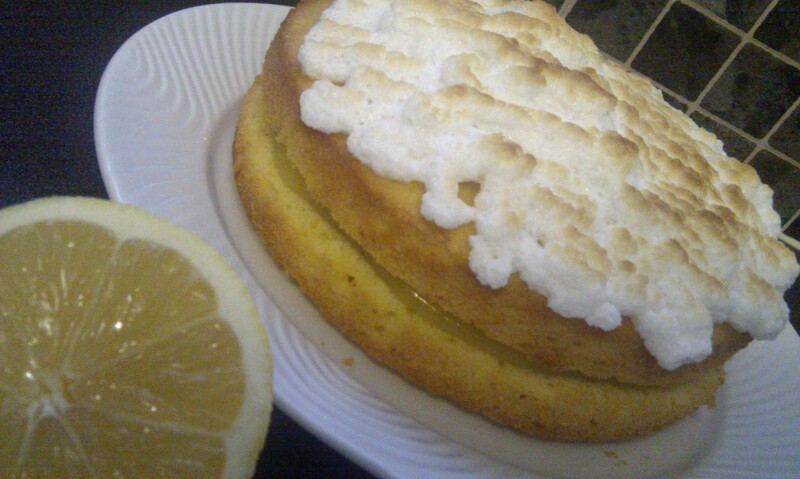 Instead of making the usual lemon meringue pie, I thought it might be nice to make a simple lemon sponge cake and then decorate it with an Italian meringue. I have to say that my cake recipe turned out very nice but I am not convinced that the meringue recipe I used is the right one for this cake. It is very soft and fluffy, which would be perfect for a pie, but for an afternoon tea cake it is a little underwhelming. I would suggest that if you want to make this cake with a meringue topping then I would instead use a meringue icing (maybe like this website: Cupcake meringue icing) and not the Italian meringue I made. The only problem with this recipe is that I wouldn’t have been able to use my new sugar thermometer! The recipe I used for the cake is one I learnt in my cooking lessons in high school. I have been using it now for 15 years – so as long as you stick to the recipe it is foolproof. In a large bowl, cream the margarine or butter together till light and fluffy. Add one egg into the mix along with 2 tbls of flour and mix gently till combined. Do the same with the other 2 eggs and flour, then add the remaining flour. Mix in the zest of the lemon and add half the juice from the lemon. Divide mix equally into two 8″ cake tins, which have been lined with non-stick greaseproof paper. 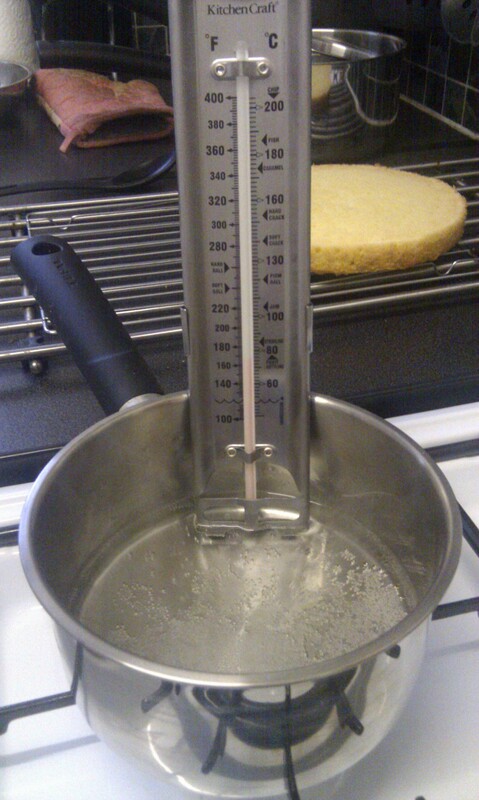 Bake cakes in the oven till they bounce back when touched (or when a skewer comes out clean), which should take approx. 20-25 minutes. Once cooled spread generously with lemon curd and sandwich together. Decorate with meringue icing, buttercream, or even just sprinkle with icing sugar – whatever takes your fancy; then get yourself a nice hot drink, cut a big piece of cake and eat!